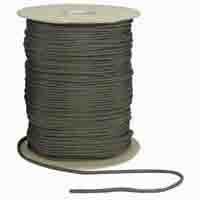 15m (50ft) replacement rope for ATV/ Quad bike winches. 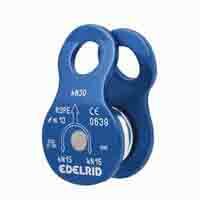 6mm (1/4") synthetic rope (12 strand dyneema) with professionally spliced eye at one end encompassing a galvanised thimble to protect your rope when attached to accessories or winch point. 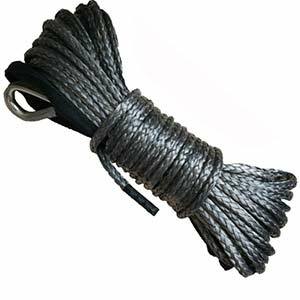 Our ropes also have a short length of rubber sheath applied to the tail end to protect the rope where it is inserted in the drum. This can be cut off if required. We are happy to replace the galvanised eye with a winch hook if required. There is a small additional cost for the hook. Please call to discuss. The quad bike replacement ropes come with a 1.5m (5ft) length of chafe guard/winch saver to protect your rope at the fairlead. It slides easily along the length of the rope so that your rope is easily inspected and cleaned. We use the famous Marlow Dynaline and can design and make your winchline to your precise specification if required. Marlow's dynaline is made with high strength, light weight UHMPE fibre which has been designed to replace steel wire winch ropes on 4x4s and recovery vehicles. Dynaline enables significantly quicker and safer deployment and recovery than traditional steel wire ropes, virtually eliminating dangerous recoil if fittings or attachments fail or in the unlikely event of rope failure. Graphite. Other colours may be available by request.